In 1023., on the tiny island of Lokrum opposite Dubrovnik, the monks of Sv. Benedict founded the abbey of St. Mary which was subordinated to the Abbey of Monte Casino. "The black Benedictines" as the citizens called them because of their black religious clothing, lived on the island for almost seven centuries exposed to the winds, waves and pirate pillaging. They survived the terrible earthquake of 1667. not knowing that it was the beginning of the end of their presence on this beautiful island of the Dubrovnik Republic. After the earthquake the economic power of the Republic started to weaken. In need of money, they turned to the Benedictines, but all of their income was transfered to Italy. Quite angry, the Dubrovnik Republic no longer wanted the monks on Lokrum, and on the proposal of three of their nobles the Senate sold Lokrum to nine of Dubrovnik citizens in 1798. As the monks couldn't oppose the decisions of the Republic and the Pope (Pio the 6th verified the decision), they had to leave the island, their properties and their monastery. Before leaving, in a unique and macabre way they "thanked" the ones because of which they had to leave. The procession started in the middle of night night, just before leaving the island. Holding candles upside-down, they circled the island three times, cursing those because of whom they were expelled after seven centuries. At dawn, dead-tired, the monks embarked on a boat and left the island, never looking back. Nevermore did they return. The legend of the curse got its actual verification as the curse reached all the island's owners until the end of the 19th century. Death first struck three of those Dubrovnik nobles who suggested the Senate that the Benedictines should leave Lokrum. One was killed by his servant, the other drowned, and the third jumped into his death from Lovrijenac fortress. The nine citizens who were the first to purchase it got so scared that they immediately sold the island to Captain Tomasevic, an extremely wealthy man that suddenly became bankrupt and was forced to sell it further on. The archduke Maximilian, the younger brother of the Austrian Emperor Francis Joseph I became the new owner. Maximilian discovered Lokrum in 1859. when he, as Navy Commander of the Austro-Hungarian Monarchy, had to honour seaman who died in the explosion of the warship "Triton". He was impressed by the silence of the thick aromatic forest that he immediately decided to purchase the island and to turn it into his summer manor. However, when he became Emperor of Mexico and left for his duties, the curse caught up. His close friend and military advisor Colonel Miguel López betrayed him and Maximilian was executed by a firing squad. His wife Archduchess Charlotte of Austria (princess of Belgium), who also resided on the island where they thought themselves to be the happiest married couple on Earth, went completely insane. Maximilian's nephew inherited the island. Already on the first day of his arrival, a very strong wind overturned his boat between Dubrovnik and the island. He drowned. private viewing by his family. Rudolf (the heir to the throne of Austria and the only son of the emperor Francis Joseph I. and the empress Elisabeth of Bavaria) took a liking to Lokrum and moved there. After a while, Rudolf fell in love with the beautiful mistress Maria Vetsera. Vetsera and Crown Prince Rudolf of Austria were found dead, an apparent murder suicide, at his hunting lodge in Mayerling in Vienna woods. They committed the sensational double suicide, which was never quite explained (the Mayerling Incident). The empress Elisabeth offered the island to the Benedictines in order to "get rid of it" but Benedictine monks remained faithful to the vow of their elder brothers. The Habsburgs even gave their money to Dubrovnik Dominicans for their purchase of the island as the new owners, under one condition: that Habsburg's could re-purchase the island when and if they so desired. But neither that was the end of the curse. We all know the end of the Habsburgs. The princess Windischgratz fired shots in a nightclub in Prague at some dancer who was a mistress of her husband, and was then disinherited by her royal parents. The archduke Francis Ferdinand and his wife Sophia intended to spend the summer of 1914. on the island, but were prevented by an assassin's bullet in Sarajevo. In 1918., after 700 years, the family lost their crown. 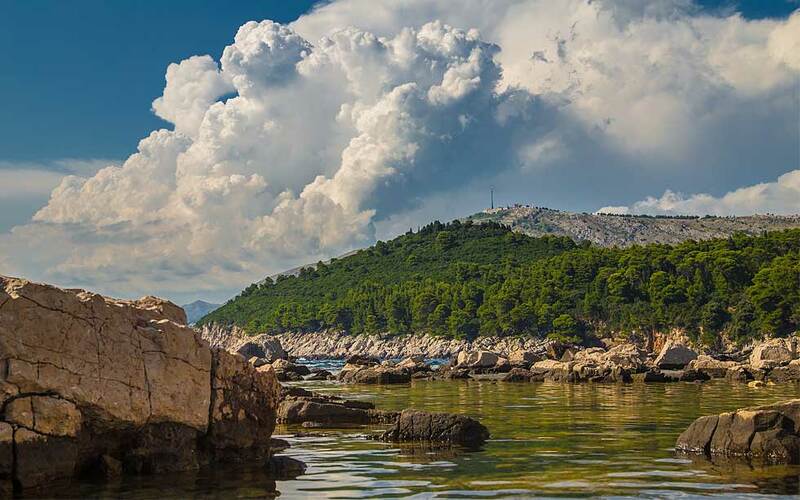 Lokrum today is an excursion site for tourists but also due to its calmness a very popular day break for locals. Its flora amazes its visitors, thousands of crickets chirp and the untouched shore attracts swimmers, divers and cliff divers. Feeling the urge to buy the island? It is said that the curse will be lifted when all the wax from the candles is picked up.